This guy has been on my desk at work since I started 3 years ago. 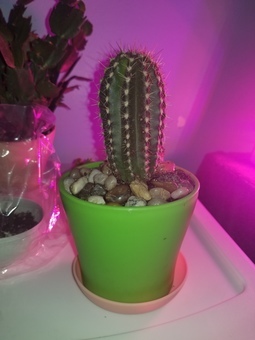 I feel like recently he hasn't been as happy as he usually is, so I am hoping someone can help me identify him so I can be sure to give him the proper care. Thank you! Pei He looks like a happy Hoya plant (at least to me :). Why do you think it's not been happy? 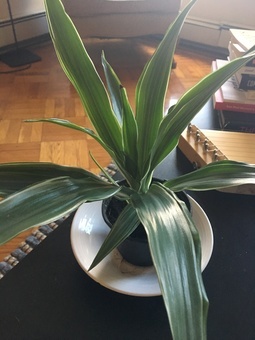 what kind of plant am I? 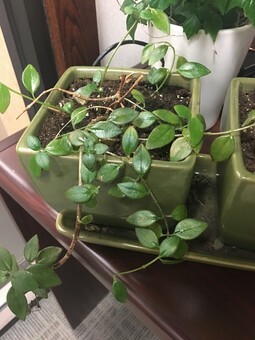 This plant is in my office. I can tell the maintenance guys overwater it. 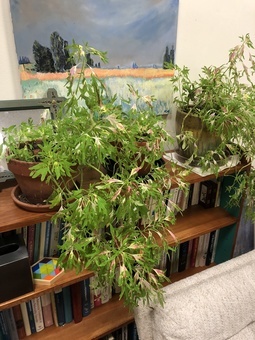 It was looking pretty grim until I fertilized it at the same time I was fertilizing my desk plants - it perked up and now it looks a lot better. What is it? Maybe I can take care of it on the sly. 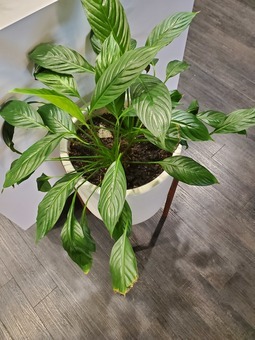 I need to know what plant is this to take good care of it. Pei you are a stunning Alocasia Frydek. I love them (all the alocasia family) but they are so finicky :( Good luck!! 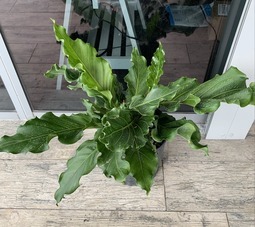 PlntNrd This is an Alocasia Frydek. 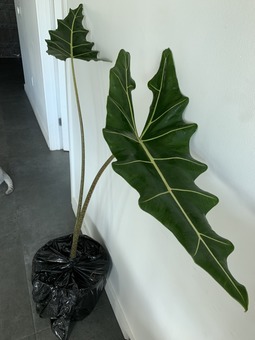 Hilary Johnston Hi Kellyn - this looks like an Alocasia Polly! A beautiful one at that. 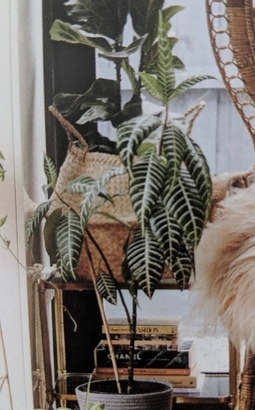 Any ideas what kind of plant this is? It was only labeled "Plant" and that was too intriguing to not bite. Pei It's a dieffenbachia, AKA dumb cane! Erin Agreed, looks like a dieffenbachia! Pei Yup my vote is a Gasteria succulent too. It's very similar to Aloes and you want to give it 5-6 hours direct light and water twice a month. The leaves would look wrinkly, like your hands in the water for too long, when it's thirsty! Erin Looks like a Gasteria succulent, but not positive which variety! 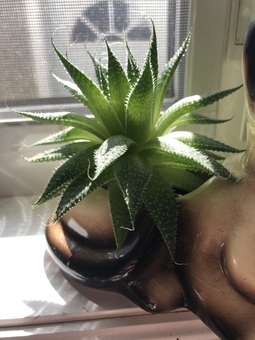 Very similar to aloes and haworthia. Loves bright direct light and not a lot of water. 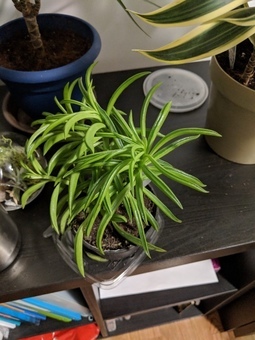 Plant ID and care tips!? PlntNrd That’s a pink or pastel Duckfoot Coleus. 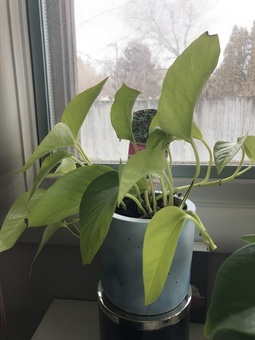 Needs full sun, usually grown outdoors. It looks like yours is craving more sun than it’s currently getting. 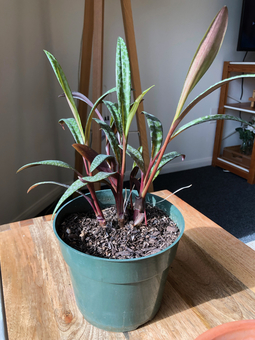 A gift from my grandma — what's this plant? Can anyone help identify? 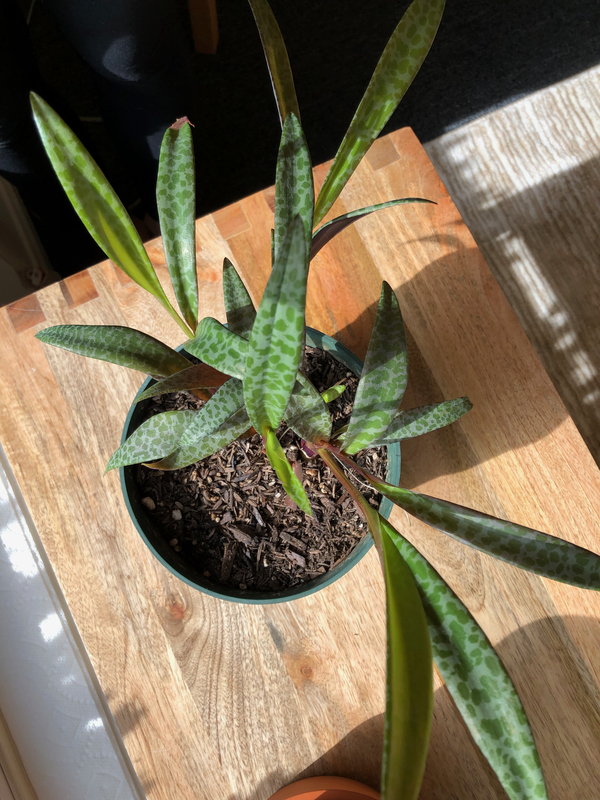 It's got what look like faded spots on its long leaves and reddish/purplish stems. I believe it might be low-light (but please correct me if I'm wrong). Amy Burke It looks a bit like Silver squill, (Scilla violacea) sometimes called Leopard plant. I just picked one up and so far so good! And how to take care (lighting, water, etc)...thanks in advance! Pei Hi [293388,Oliver], it's a Tradescantia zebrina, AKA wandering jew. They like bright indirect to semi full sun environment. If provided the right light, you want to water it once a week or once every 10 days. Always make sure the soil is dry to touch about 1 inch to 2 inch down. Hope this helps! What cactus is this? Will it flower? PlntNrd Sometimes it very hard to tell the exact species or cultivar of a cactus or succulent without actually seeing the flower. That said, yes, if given the proper/optimal conditions, it will flower and I think this might be either a Pachycereus or Pilosocereus. Erin It's a beautiful Pothos plant! As Pei said, super easy to care for so that's great. I'd recommend pruning off any dead or crispy leaves if you haven't already. 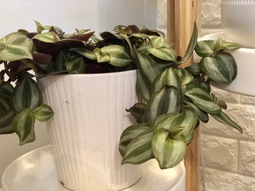 Generally pothos thrive in moderate indirect light, and with waterings about every 10 days (more frequent with more light). If you're scared to overwater- it'll visually droop when thirsty so that's a good sign to look for. I notice a little crispiness- any chance you have it by a heater? If so, definitely move it a few feet away. It doesn't love a dry environment but spring is on the way! 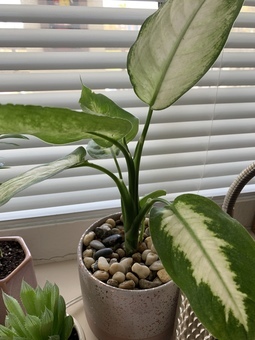 Pei Hey @Greyson it’s a marble queen pathos a very easy plant. how often do you water it? How much sun does it get? It does look like it’s close to a window from the photo. 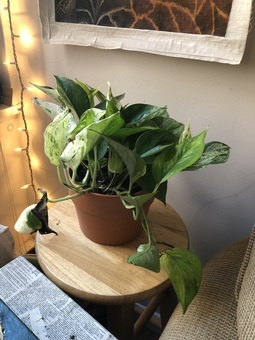 Katie It's a pothos! A very easy going houseplant!